Walking is becoming an increasingly popular mode of transportation, since it provides people with a healthy and eco-friendly way to travel. 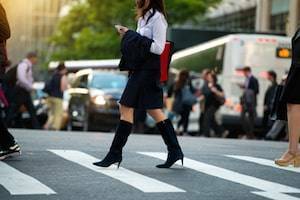 According to the U.S. Census Bureau’s American Community Survey, around four million Americans reported that they walked to work in the past week. Unfortunately, pedestrians are one of the only categories that have seen an increase in traffic fatalities in recent years, while most other categories of fatalities have decreased. According to the National Highway Traffic Safety Administration (NHTSA), there were nearly 6,000 pedestrians killed in traffic accidents in 2016, and these amounted to around 16 percent of all traffic accident fatalities. Fortunately, pedestrian accidents can be prevented if both pedestrians and drivers follow certain safety tips. Keep an eye out for pedestrians. Make sure you are always prepared for anything. Pedestrians can appear at any moment, which is why you must be alert. Use caution in hard-to-see conditions. If there is inclement weather, such as snow, rain, or fog, make sure you adjust your speed accordingly. Not only can these conditions make it harder to see, but they will also cause your vehicle to take a bit more time to stop. Do not drive under the influence. Never drive while you are intoxicated by drugs or alcohol. You could not only face serious criminal consequences, but you will also be putting yourself and others in danger. Be attentive. Make sure you are aware of your surroundings. Do not allow your cell phone to distract you while you are walking, and avoid wearing headphones. It is just as important to hear everything around you as it is to see everything around you. Always walk on sidewalks. If you are walking on the sidewalk, you have put yourself out of the lane of traffic. If there is no sidewalk available, walk facing traffic and as far away from the road as possible. Be visible. Especially if you are walking at night, be sure to wear brightly colored or reflective clothing so that drivers can spot you more easily. However, even if you are wearing bright clothing, never assume a driver sees you. Be predictable. Try to stay in places where drivers expect pedestrians to be. If you have to cross the street, do so at crosswalks or intersections. Traffic accidents involving pedestrians are serious and can result in lifelong, debilitating injuries and even death. If you or a loved one has been injured or killed in a traffic accident, you need help from a Wheaton, IL pedestrian accident lawyer. At Walsh, Knippen & Cetina, Chartered, we know how devastating a pedestrian accident can be. Contact our office by calling 630-462-1980 to discuss your situation in a free consultation and begin building your case.